ER Bin Hire is a part of Eastern Recycling at our Ringwood depot and as such has access to state-of-the-art recycling facilities. We care about the disposal of your waste, domestic or commercial. Our drivers are professional, courteous and fully trained. They know their vehicle and its capabilities and have an excellent working knowledge of the suburbs we service. Our bins are designed, purpose-built and maintained by us. This is important as it gives us the flexibility to create a range of useful sizes with features like doors and location points that make unloading and retrieval easier in tight places. We pride ourselves on service and have many long-term customers who use us, not because we are $5 cheaper, but because we deliver when we say we will. It’s important to coincide delivery with your machinery as ‘time is money’ - if we have a problem with a delivery time, we will ring you with an ETA. Hook-lift bins (roll-on roll-off) 6m3, 8m3, 10m3, 18m3 and 27m3. Confused by what size bin you will need? Have a look at our sizing page and select a bin that best suits your job. 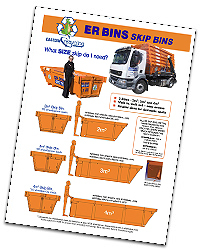 ER Bins are delivered in a radius of roughly 20kms from our depot in Ringwood. This may vary depending on location, so give us a call and we will be happy to verify availability of a bin to your address. As we deal with various councils on a regular basis, we have come to understand the rules and regulations peculiar to each. Every council has its own topography, population density and zones within each that have unique restrictions, so you will find it much easier to access the information you seek by giving us a quick call. If a bin is not accessible or available please contact ER Bins by telephone prior to your pick-up date to avoid being charged a ‘Failed Pick-up Fee’ – please call our office between the hours of 7.00am and 5.00pm. Note: If a truck is dispatched to pick up a bin that is not available or accessible, a fee will be charged. Our drivers operate between 6.00am and 6.00pm Monday to Saturday, depending on work load, including some public holidays. 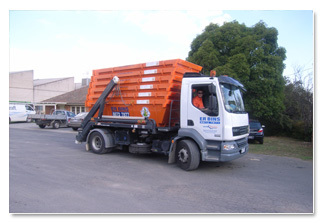 We endeavour to pick-up when agreed, but occasionally, after public holiday periods, we may be late due to popularity of our bin hire and the amount of bins to be collected on that day. The cost of your bin? As the cost structure for bin hire can be complex, we recommend you give us a call and our operator will have a quote for you within a couple of minutes. We discuss the ‘size’ of bin you need, ‘locate your address and suburb’, assess the desired location of the bin and any necessary ‘local council permits’. Standard bin hire includes: 1 x Delivery and Pick-up fee, Delivery Day plus 1 x full Day Hire and Tipping Fees based on bin volume only. Furniture, electrical goods, white goods. Contaminated and or hazardous wastePutrescible waste such as food, garbage etc. Eastern Recycling hand sorts all loads for recycling and if we find any of the above unacceptable waste items in your bin, then you the customer will be liable for any or all of the following. Extended bin hire fee, extra delivery/pick-up fees, damages, clean-up and handling costs, load returned to your site and emptied, cross contamination loads and notification to the relevant authorities. This is done to protect our workers from personal injury and Eastern REcycling from relevant state authorities and national waste laws. All ER Bins are clearly marked as to the level waste must not exceed – this is level with the top of each container – Road laws now govern our drivers and you our customers (through chain of responsibility), with fines for unsafe or overloaded bins. Excess will be unloaded on-site or the bin left and failed pickup and extended hire fees charged to the customer. When you hire a bin you are entitled to the capacity of the bin hired only. Please also note that each bin has a gross load limit and this limit must not be exceeded. We realise the importance of delivering our bins on-time to your location and will endeavour to make sure we are on-time, every time, with delivery to your location. We appreciate timing is critical to some of our customers when coordinating work schedules, tradespersons and their machinery and so we do our best to work with the customers for the best result. Once a bin has been delivered there are costs to relocate it, so make sure you have thought clearly about where you want it located. Outside your property boundary, such as the nature strip. Every council has laws about bins located outside property boundaries and as such you are responsible for understanding any restrictions – we help our customers with relevant costs and council notification. This is the best place for the location of the bin if possible, but make sure it will not restrict access by people, wheelbarrows or machinery and most importantly make sure we have the room to back our truck in. Most people don’t realise that we need a minimum width of 3M to allow for truck access and enough space for the bin to be placed. Sloping blocks and unstable surfaces also need to be considered. One thing most customers overlook is possible damage to the surface where the bin is placed. A good rule of thumb is the ‘bigger’ and therefore ‘heavier’ bins with rear rollers, are more likely to damage the area on which they are located during pick-up. The weight of the bin transfers to the rear rollers as it is being lifted onto the truck which can crack concrete driveways or gouge soft bases such as lawns. Our drivers are instructed not to access properties or nature strips where it is reasonably foreseeable that damage may be done. Where bins are placed through compliance with the customer’s request, Eastern Recycling does not take responsibility or accept liability for damage to surfaces, services, gardens or infrastructure. If our drivers have concerns that delivery or the later retrieval of the bin may cause damage to their vehicle (break a mirror, beacon or aerial) through low hanging cables, trees or the eves of houses, then at their discretion they may refuse to deliver the bin in the location suggested. The driver will suggest an alternative or not complete the delivery at all. If a customer requests that a bin be placed on a slippery or grassy property that may be compromised by coming weather causing the vehicle to possibly get bogged or not be able to retrieve the bin for some time then they may again refuse the job. These discretions are for the safety of our vehicles and drivers and continuity of service to our customers. Eastern Recycling fully supports its drivers and their judgment.